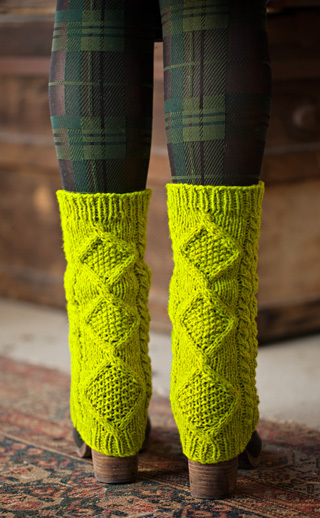 These worsted weight leg warmers are a perfect addition to any winter accessory wardrobe. With a traveling diamond motif and knit in the round, they can be worn several different ways. You might tuck them into your tall boots with the tops just peeking out, or maybe you would pair them with a pair of shorter boots, or your favorite shoes, for a really long-legged look.